Pet First Aid Awareness: Being prepared will help keep your furry friends safe and healthy! The American Red Cross has designated April as Pet First Aid Awareness Month. Just as the Red Cross is oftentimes the first responder when disasters strike, they are also a leader in providing life-saving information and helping families and communities become emergency-prepared. Two of the biggest actions they recommend to become “Red Cross Ready” is having a family disaster plan and creating an emergency first-aid kit. Because our four-legged friends are beloved members of our families, the Red Cross encourages pets to be included in disaster plans. In the event of natural disasters or house emergencies such as fires or floods, pets will need to be safely evacuated from the home. 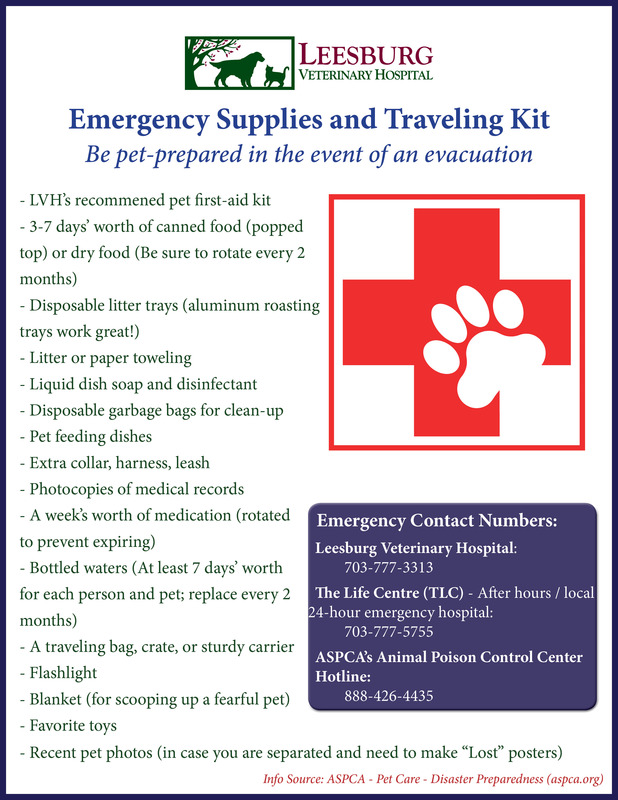 In this article, the Red Cross offers some advice in the event of an evacuation; for more in-depth information on what you can do to prepare your pets for an emergency, download this helpful Pets and Disaster Relief Checklist. Also mentioned in the image above is the Red Cross’s Pet First Aid App. This mobile app is an awesome asset to have when you’re on the go and need step-by-step instructions for first aid emergencies, early warning signs for when to contact a veterinarian, and even pet profile pages to store records of your pets’ diet, medications, and other reminders. You can download the app from the Apple App Store or Google Play Store for Android, or watch this You Tube video for more info! 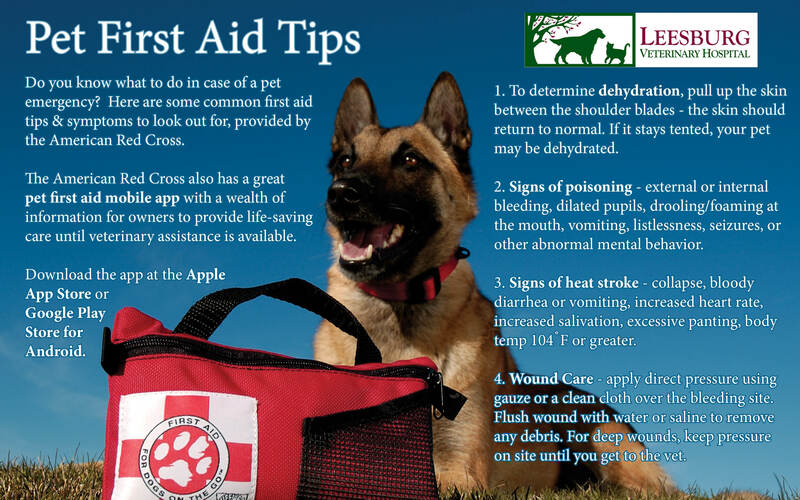 Lastly, every pet owner should have a basic first aid kit on hand at home or with you when traveling with your pet to help you deal with a medical emergency. Sometimes the easiest way to create a pet first aid kit is to buy a human kit and build on it with pet-specific items. 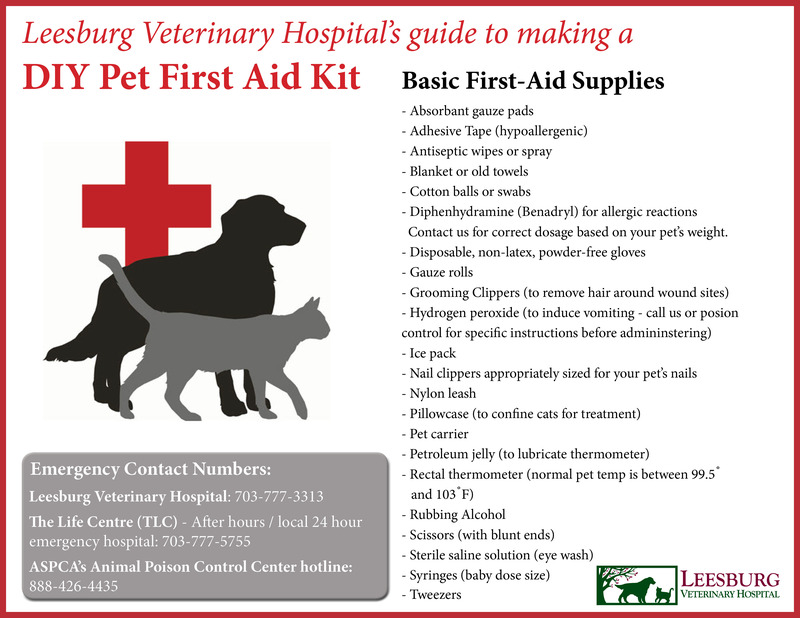 Here’s our list of recommended items to include in your pet’s first aid kit. Don’t forget to include any medical-related items or medications related to your pet’s specific needs. And remember, any first aid administered to your pet should be followed by immediate veterinary care. First aid care is not a substitute for veterinary care, but it may save your pet’s life until they receive veterinary treatment. You can get our step-by-step instructions on how to apply a pet bandage here. ← The Perfectly Poised Pup: Learn the secrets at LVH’s puppy socialization classes. Being prepared and knowledgeable about pet first aid techniques could possibly help save your pet’s life one day! Thanks for sharing.